Including bananas in your child’s diet will help you to provide him or her with many beneficial nutrients. Bananas are a highly nutritious energy-packed fruit. Bananas contain manganese, vitamin B₆, vitamin C, fiber, potassium, iron, vitamin A, biotin, and other nutrients. It is a low-fat food. Glucose, fructose, and sucrose are the natural sugars present in bananas which boosts energy. Your child can be highly benefited from this fruit. Bananas are very sweet and creamy fruit and they are available throughout the year. As they ripe, the bananas become sweeter and softer. Have a quick look at the top AMAZING health benefits of bananas for kids. Bananas are considered to be a sports food. The carbohydrates present in ripe bananas gives instant energy. Children are very physically active the whole day. They also get tired very fast and they need a lot of energy to do many activities. For maintaining the energy levels of your child, give him bananas regularly. Ripe bananas are energy boosters. You may give them bananas immediately after they come back from play. They will feel energized. The fiber present in bananas helps in good digestion. Bananas also contain a type of fiber called pectin which is water soluble. These water-soluble pectins increase and lead to the ripening of the bananas. This aids in proper digestion by converting the carbohydrates into simple sugars that are released. Regular intake of bananas regulates the bowel moment of your child and prevents gastrointestinal problems. The fibrous content gives a feeling of fullness and your child will not feel hungry for a long time. Bananas are potassium-rich food. The potassium neutralizes the sodium that may be present in your child’s diet and thereby makes your child’s bones strong. The calcium that is lost during urination can be supplemented by a banana. Children who eat bananas regularly have better eyesight. Bananas can improve your child’s vision. Vitamin A is present in bananas and they are good for eyesight. It protects the retina from any kind of diseases. Iron deficiency, where there is an absence of red blood cells production, leads to anemia. Your child’s diet should include iron, folic acid, vitamin B₁₂, and copper in sufficient quantity for the formation of red blood cells. A banana is enriched enough with all of these nutrients and helps in producing hemoglobin. Iron is good for your child and prevents your child from getting anemic. Bananas can be good fuel for your child’s brain. Potassium present in bananas helps in circulation of blood and thereby boosting the brain. Bananas can also increase your child’s concentration-power. You may give them bananas as snacks to school or in between study hours. 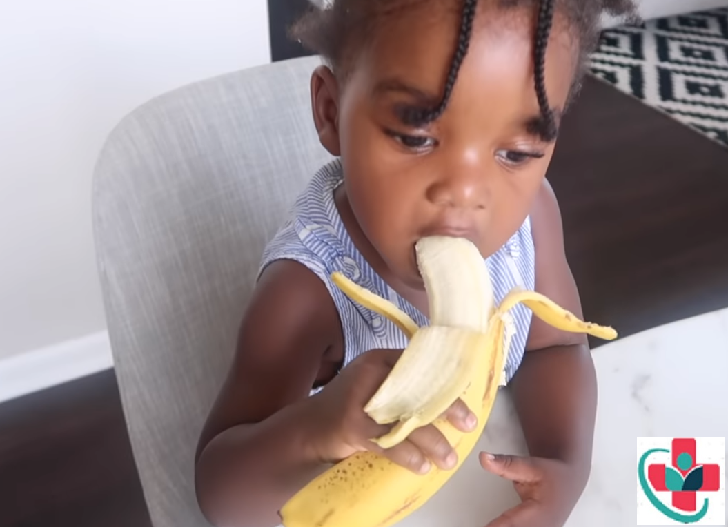 If you want to elevate the mood of your child, just give one banana. It will immediately relax your child. It does not involve a lot of work in peeling. Bananas can be mashed and given to your child. They can also be given in the form of banana shakes. You can also make cupcakes with banana or include them in desserts. Bananas are available at all seasons. How can I determine how many bananas is too much? Are there any negative consequences of allowing her to eat bananas to her heart's content? Make sure she's eating enough of other foods. As long as she is getting plenty of protein, green veggies, dairy/calcium, and the other things she needs, and the bananas aren't causing problems with her digestive tract, then I'd say go ahead and let her eat what she wants. Letting her pick how much to eat is the healthier way to go, so long as you give her a selection of healthy foods and make sure this isn't replacing her full meal. If you do find it is replacing her full meal, then treat it like dessert or snack - only give it at times a few hours before the next meal.